It was also a year that saw General Assembly wins by three women backed by the Democratic Socialists of America, a leftist organization that’s risen to new prominence since Sen. Bernie Sanders ran for president on democratic socialist ideals. The emergence of the DSA in Pennsylvania politics comes as more young Americans are embracing the concept of socialism. In their public comments, leaders of Pa.’s Democratic party have welcomed their left-leaning comrades. Republican state chair Val DiGiorgio seized on that comment in an op-ed (Dems “espouse a radical and, frankly, frightening direction for our nation”) and invoked the perceived evils of socialism in a number of emails in the lead-up to Nov. 6. Those warnings didn’t stop three of the four DSA-backed candidates on the Nov. 6 ballot from winning. And it’s unlikely in the near-term to dampen part of the electorate’s enthusiasm for progressive policies. Philly’s DSA chapter dipped its toes into electoral outreach for the first time in the 2018 elections by endorsing and canvassing for two state House candidates in the city and the ‘burbs. While only one of those pols will head to Harrisburg next year, jumping into the competitive fray appears to have generated some momentum for the fledgling chapter. In South Philadelphia, Elizabeth Fiedler, a former WHYY journalist and a dues-paying member of the Philly DSA chapter, trounced her Democratic opponents in a four-way Democratic primary before going on to win an uncontested general election on Nov. 6. Her candidacy landed her in the national headlines next to DSA star Alexandria Ocasio-Cortez and others. Next year, Fiedler will join Innamorato and Lee as the first DSA-backed candidates to join the General Assembly. Meanwhile in Delaware County, DSA-endorsed Democratic candidate Kristen Seale narrowly lost to incumbent State Rep. Chris Quinn. But with less than 1,000-vote margin in a district long held by Republicans, there’s still a sense of victory. Alex Nagle, who chaired the electoral evaluation committee for Philly DSA this year, said the 900-member chapter sent DSA canvassers to Delco starting months before the election. “We took a district where a Republican previously won by 12 or 15 points and narrowed it down to a few hundred votes, so all told I think it was a pretty historic effort in a deep red district,” Nagle said. As in Pittsburgh, Philly’s DSA honed in on an issue that studies show resonates on both sides of the political spectrum: Medicare for All. The Bernie Sanders-backed push for a single-payer healthcare system has a counterpart in Harrisburg, which became a campaign pillar for both Seale and Fiedler. DSA was happy to get behind the effort. Of course, it’s hard to trace the organization’s direct impact on the races’ final outcome. Like their Pittsburgh counterparts, both Philly candidates also garnered influential support from traditional Democratic kingmakers. But Fiedler has said her candidacy is political proof that you can run on the Dem ticket without shying away from “socialism.” Moreover, she doesn’t dismiss the impact of DSA boots on the ground in helping her clinch the heated primary election. “[Philly DSA] turned out quite a few people to knock doors for me for months leading up to the competitive primary, taking both about my candidacy and Medicare For All,” she said. In Pittsburgh and its suburbs, Sara Innamorato and Summer Lee easily beat longtime state representatives Dom and Paul Costa on a people-first platform that included support for single-payer healthcare and a higher minimum wage. Ten candidates sought the Pittsburgh DSA’s endorsement in 2018, and three got it (state House candidate Kareem Kandi lost his primary). Endorsements reflect the values of the chapter’s members and their votes, communications coordinator Becca Tasker said. The Western Pa. chapter is currently 900-plus strong, a number that’s more than doubled since the beginning of the year. Tasker said DSA members offer support like canvassing and data entry to endorsed candidates — wherever the “people power” is needed. During the primary, neither Costa cousin seized on their opponents’ DSA affiliation. The same couldn’t be said during the general election. The midterms were even more contentious for a Pittsburgh candidate who sought the DSA chapter’s backing but didn’t get it. 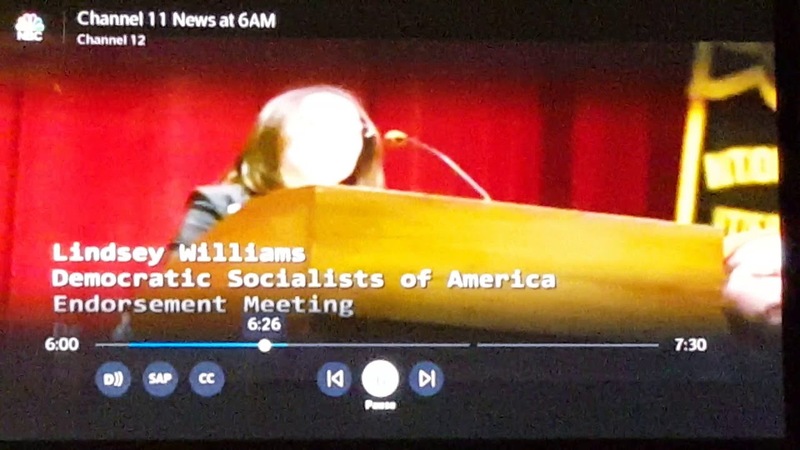 Lindsey Williams won a closely contested state Senate seat in Pittsburgh’s northern suburbs after being the target of ads featuring an actor in Soviet garb and signs connected with her opponent Jeremy Shaffer that labeled her a socialist. Philly DSA’s first electoral experiment wasn’t without growing pains. Nagle declined to comment on internal discussions, but several sources close to the organization told Billy Penn there are political rifts the chapter will have to reckon with in 2019. Four state House candidates sought the chapter’s endorsement this year, which revolved around specific policy questions. Only two were endorsed. Philly DSA was heavily divided over whether or not to back Democrat Mike Doyle in his ill-fated bid against state Rep. Martina White in far Northeast Philly. Some were hellbent on unseating White, the pariah of city progressives, and saw Doyle as a worthy investment. Other said Doyle’s politics didn’t jibe with the soul of DSA — despite the fact that the candidate became a member earlier in the year. After a nearly split vote, the Philly chapter declined to endorse him. Doyle did, however, secure nods from Bux-Mont DSA, the combined chapter for suburban Bucks and Montgomery counties. Fiedler acknowledged there were some “serious challenges” within the organization, but declined to elaborate further as she hasn’t been directly involved with the chapter’s discussions about its electoral future, she said. But the insurgent Democrat also suggested that there is real energy in the organization — both statewide and nationally. Several DSA members told Billy Penn they feel the Philly chapter will find its stride in 2019. The contentious internal debates will be hashed out with definitive convention votes among members, and they’ll move forward on to bigger questions from there — like whether or not to back a candidate for City Council, and what resources to allocate for 2020. The endorsement of the Pittsburgh DSA is “open to anyone who wants to seek it,” Tasker said. In 2019, that could include candidates for city and county council, school board, and district attorney. The chapter does not recruit candidates. “The biggest thing that sets our candidates apart is they do believe, truly, in what they’re saying,” Tasker said. While party leaders have shown a united front, there are Pennsylvania Democrats who have spoken against the socialist faction or its policies. Gov. Ed Rendell, in an op-ed for The Hill, warned the party was moving too far left on issues like healthcare, while former Allegheny County state Rep. Nick Kotik said in a TV interview there’s concern the DSA is pushing Democrats to the Republican party. Fiedler, Innamorato and Lee became friends during the campaign and used each other as a support system. When they’re sworn in next year, they’ll be part of a small but growing progressive voting bloc primarily from Philadelphia and Pittsburgh.